What Metals can be Successfully Welded with Fiber Lasers? 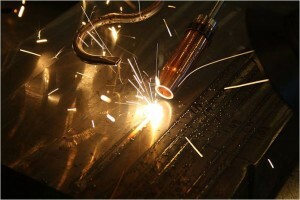 Laser metal welding is just one of the many laser-based processes, which can be completed with a fiber laser. In this application, the laser beam is targeted to melt two metallic objects together to create a strong, durable and permanent join between them. We are focusing on metal in this article, but laser welding can be used on a wide variety of other materials too. Many metals don’t naturally want to be welded together (e.g. Copper and Aluminium), they will have different mechanical and/or chemical properties which resist each other. There are a large number of industrial applications for dissimilar metal welding, such as welding lithium-ion battery cells, the process is popular in Automotive and the Electronics industry in particular. Fiber lasers can be used to create strong, permanent welding joins between metals which would be difficult to weld through traditional techniques. SPI Lasers are always here, to discuss any of your welding enquiries or to discuss any fiber related topic. Why not contact us today, or complete our contact form for a call back. If you are interested in news about SPI Lasers, then subscribe to our updates.